I love shopping at local Farmer's Markets. With fresh, organic produce, free range meat sales, even fun items like clothing! This fun Market Fresh stamp set delivers a sweet hand-stamped card that is easy to create. Join Us in creating and sending cheer, wrapped up in a hand-crafted card! 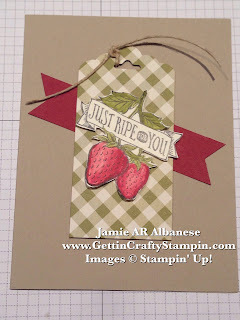 Fresh berries waiting to pick.. or send to a sweet friend in this hand-stamped Just Ripe for You card. 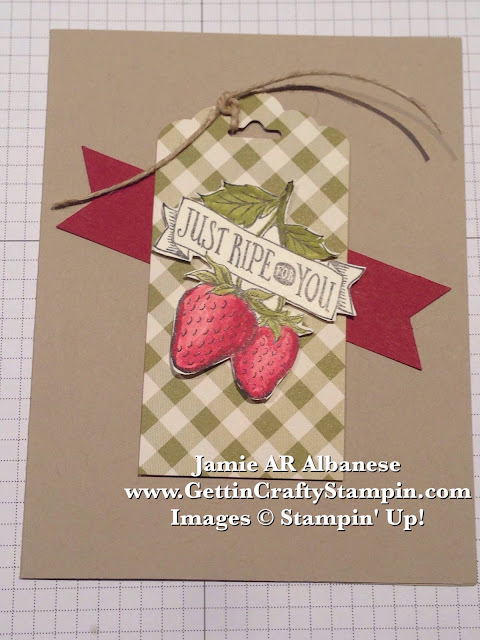 Stamping the image on Very Vanilla card stock you can water color the image with Old Olive ink and Cherry Cobbler ink using the Aqua Painters! I love that you can add shadow and depth with extra color layers painted on. The Old Olive ink ties into this pretty gingham Old Olive printed paper. Cut the stamped and water colored image out using the Paper Snips and layer over the Scallop Tag Topper Punched pretty Farmers Market Designer Series Paper. 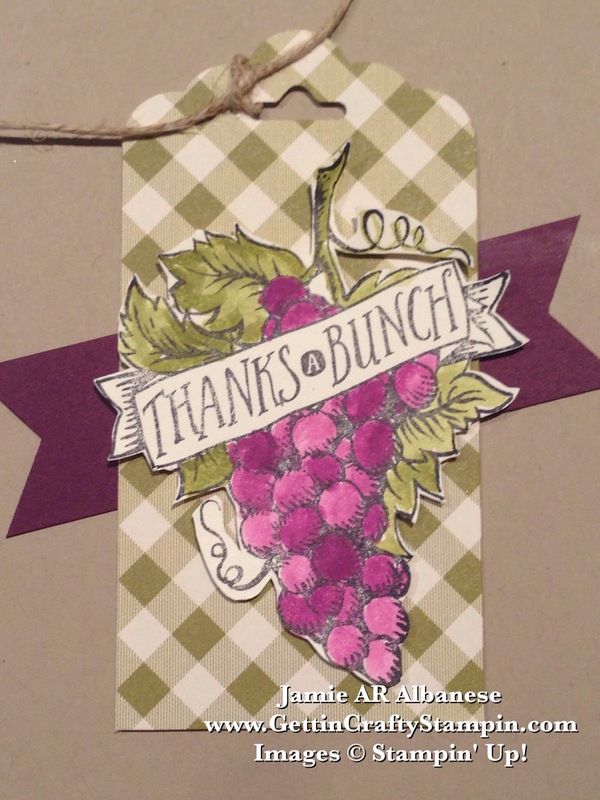 The Triple Banner punch creates this cute banner edge on this card stock. I grew up in Santa Maria, Ca where we have a Strawberry Festival every year. I don't like many berries but I LOVE Strawberries lol. 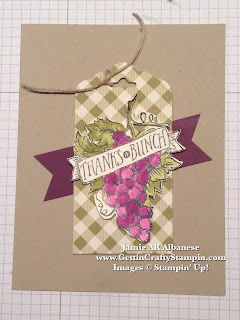 Grape wishes with this Thanks A Bunch hand-stamped card. The Blackberry Bliss, an In Color, looks juicy as a water colored grape bunch! 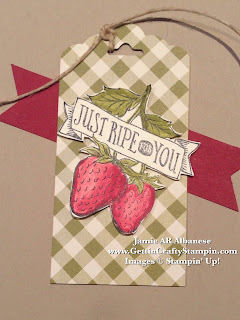 A rustic accent using the Linen Thread tied to the top of this punched tag.. it's perfect for a cute rustic accent. 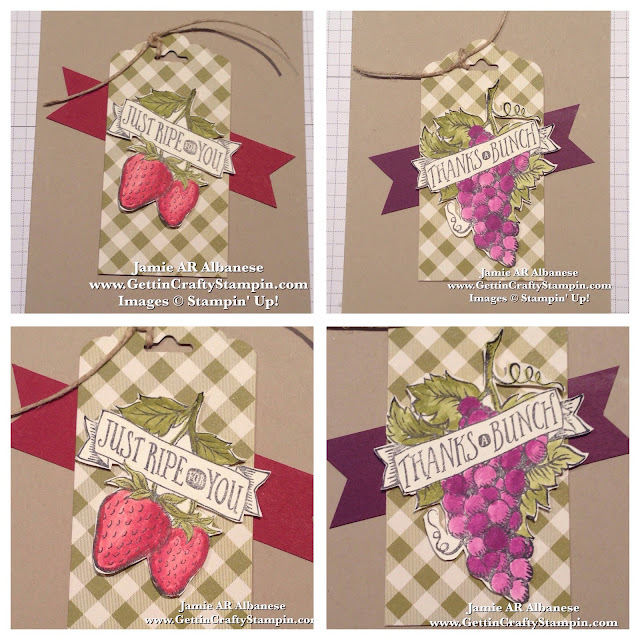 Create a sweet card that is almost good enough to eat! This Farmers Market Designer Series Paper, Market Fresh stamp set and cute accents makes it easy to deliver a perfectly delicious hand-stamped card. Created at a recent card making class, we had fun personalizing and playing with this great collection. Join me in sending smiles in the mail with a hand-crafted card.